Give your Sweetheart the Red Carpet service on Valentines Day! Take an intimate tour of Colorado Springs while sipping champagne, eating chocolate covered strawberries and enjoying private conversation with that special someone. Dinner and a show or just sightseeing? Name your fancy for a fun filled evening. Heat up your New Years Eve in Elegance! Whether it's a Night on the Town, Romantic Dinner, Ball or Gala, Fun with Friends, we have the limo or party SUV for you. Let us be your designated driver so you can celebrate the beginning of a new year safely in confidence. Availability Limited so get your free quote now or call 719-722-2912 for reservations! No matter if you are Naughty or Nice, everyone enjoys a Magical Limousine Ride! Have a Tree-mendous time on one of our Colorado Christmas Light tours! ​Soak in the sights and sounds of the season with a luxury ride through a winter wonderland. Snuggle up with a special someone while sipping hot coco, wassail or wine. 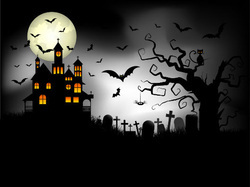 Have a Spooktacular Time on one of our Haunted House Tours! Ghosts, Goblins & Ghouls, Oh My! You'll have a Ghoulishly Good time with one of our Frighteningly Friendly dressed up drivers (if you wish). They will pick you up and take you to the scary Haunted House, Corn Maze, Halloween Party of your choosing.